Morar raised, Edinburgh based Mairi Orr released her debut album this week and she was fortunate enough to have two launch parties celebrating this achievement. She played Edinburgh last weekend and tonight it was Glasgow’s turn. Reviewing the album, Jenny Does Burn Blabber’n’Smoke mentioned that Orr had gathered together a “dream band” whose playing, along with her fine voice and writing skills raised the album well above the bar. 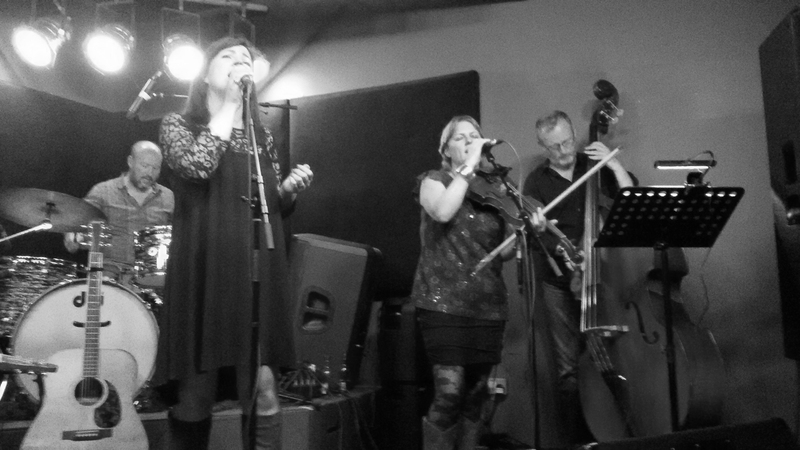 For the launch shows she was able to retain the majority of this gifted bunch with Steven Polwart on guitar, Dave Currie, Dobro and guitar, Nico Bruce double bass and Mattie Foulds on percussion while Danny Hart’s fiddle parts were handed over to a fellow Morar musician, Eilidh Shaw. From the off it was clear that the all acoustic ensemble were something special, the opening song, The Drover delivered with a haunting sense of mystery with Polwart’s guitar and Currie’s Dobro slyly weaving together over cymbal washes and delicate mallet playing from Foulds. As the song slowly unfolded they were spellbinding, memories of Fairport Convention, The Pentangle and other stalwarts from the heyday of folk rock were summoned up. The song itself is a tremendous invocation of ancient days but the playing was, simply put, gobsmackingly brilliant, sending shivers up the spine. They played all of the songs from the album although the running order was rejigged. It was a hard task to follow the opening number but the brisk fiddle led country romp of Don’t You Wed Another Man, Maggie was up to the job allowing Eilidh Shaw to shine and featuring some fine counterpoint singing. The title song swayed exotically and hearing it live one felt that it was reminiscent of the late Kirsty MacColl’s ventures into Latin American music. In fact hearing the album fleshed out live offered insights into some of the songs that were not immediately apparent from the record. I’m Not A Gambling Man revealed its debts to Hank Williams and Western swing while Just A Fallow Year seemed to have more of Richard Thompson’s bleakness than was apparent on the album. Orr was engaging as she introduced several of the songs explaining their origins. She spoke about growing up in Morar on Silver Sands, family memories on The Piper of Peanmeanach and Summer On The Clyde and of her mother’s search for a cluster of Ragged Robin flowers. The delicacy of the band playing amplified the sense of nostalgia (and sometimes, regret) embodied in these songs although there was also some welcome bawdiness on the rousing The Drinker’s Wife. However they kept the best to the last with an astounding version of Letting It Go, a song of regret that on the album again harks back to Richard Thompson like melancholy. Here the band slowly built to a climax with the instruments meshing together anchored by some muscular bass playing from Bruce as the fiddle skirled and Dobro snaked away to create a devilish din with Orr raising her voice over the maelstrom. A cracking performance it bookended the show perfectly. There was time for an encore and they ran through a grand version of Dirk Powell’s Moonshiner with Dobro and fiddle battling away and a definite Celtic air to the delivery. This entry was posted in Live and tagged Dave Currie, Eilidh Shaw, Mairi Orr, Mattie Foulds, Nico Bruce, Steven Polwart, The Glad Cafe. Bookmark the permalink.